Rogers Stirk Harbour + Partners LLP (RSHP) is a British architectural firm, founded in 1977 and originally known as the Richard Rogers Partnership. Its main offices are located in the Leadenhall Building, London. Previously they were at the Thames Wharf Studios. In its various incarnations it is known for many important buildings including Lloyd's building and the Millennium Dome in London and the National Assembly for Wales building in Cardiff. Leadenhall Building, designed by RSH+P and now its head office. In the foreground, the Lloyd's building also designed by RSH+P. Level 14, 122 Leadenhall Street, London. The firm's principal offices are located at Leadenhall Building in London. It also maintains offices in Shanghai and Sydney. As of March 2016[update] the firm has thirteen partners, including Richard Rogers, Graham Stirk and Ivan Harbour. The practice is run with a profit-share scheme and a limit on the directors' salaries in comparison with those of the lowest paid in the office. Soon after the Pompidou Centre in Paris was opened in 1977, Richard Rogers formed the Richard Rogers Partnership and started work on the Lloyd's building in London. Richard Rogers explained the reason for the change of the practice name from the Richard Rogers Partnership to Rogers Stirk Harbour + Partners in 2007 was because "We wanted to avoid the situation where the name of the practice is someone who died 100 years ago. Architecture is a living thing. If I want to leave something to the future, it has to be able to change – but retain something of the ethos that we built up over 50 years." In November 2015 Rogers Stirk Harbour created five new partners including Tracy Meller who became their first woman partner. Founding partner Mike Davies stepped down. In 2006 the practice was awarded the Stirling Prize for their Madrid-Barajas Airport, Terminal 4. In 2008, Rogers Stirk Harbour + Partners was awarded the Manser Medal for Houses and Housing, given for the best one-off house (Oxley Woods) designed by an architect in the UK. In 2009 it was awarded the Stirling Prize for Maggie's Centre in London. It won the RIBA National Award 2015 for NEO Bankside luxury apartments in London and was subsequently shortlisted for the Stirling Prize for the second time. This list contains projects from the beginning of the partnership in 1977 through to the present day. For earlier work by Richard Rogers, Team 4, Richard and Su Rogers and Piano + Rogers, see the Richard Rogers page. 124 Horseferry Road (Channel 4 Building), London, England. 88 Wood Street, London, England. Maggie's Centre, London, England. The practice won the 2009 Stirling Prize. International Towers Sydney, Sydney, Australia. Richard Rogers is the 2007 Pritzker Architecture Prize Laureate and was knighted in 1991 and made a life peer in 1996. Rogers' first work came when he co-founded Team 4 in 1963 with Su Brumwell, Wendy Cheeseman and Norman Foster. Team 4’s first project was Creek Vean, a residential property in Cornwall. Team 4 dissolved in 1967. He then established a partnership with Su Rogers (née Brumwell), John Young and Laurie Abbott in 1967. 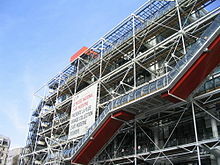 By July 1971 Rogers had won a design competition to build the Pompidou Centre in Paris with co-partner with Italian architect Renzo Piano. In 1977 he established the Richard Rogers Partnership with Marco Goldschmied and Mike Davies, where they went on to build the Lloyd's building and Millennium Dome both in London, the Senedd in Cardiff, and the European Court of Human Rights building in Strasbourg. He is a winner of the RIBA Gold Medal, the Thomas Jefferson Medal, the RIBA Stirling Prize, the Minerva Medal and Pritzker Prize. Ivan Harbour joined Richard Rogers Partnership in 1985, in 1993 he was made a senior director. In 2007 the practice changed from Richard Rogers Partnership to Rogers Stirk Harbour + Partners. Harbour led the design team for the Senedd (National Assembly for Wales building), Terminal 4 Barajas Airport, Madrid (winner of the 2006 Stirling Prize), the Law Courts in Antwerp and Bordeaux and the European Court of Human Rights building in Strasbourg. Harbour was lead architect for the Madrid Airport Terminal 4 project and Project Director for the first Maggie’s Cancer Centre in London (winner of the 2009 Stirling Prize), and 300 New Jersey Avenue, an office building in Washington DC (due for completion in Summer 2009). Graham Stirk joined Richard Rogers Partnership in 1983 and was made a senior director in 1995. In 2007 the practice changed from Richard Rogers Partnership to Rogers Stirk Harbour + Partners. He has been involved in the design of a number of projects in the UK as well as projects worldwide, including Japan, USA, France, Italy, Spain, Germany and Ireland. Stirk is the Design Director of several major projects, including a 48-storey office tower at 122 Leadenhall Street that could become the tallest tower in the City of London and NEO Bankside in London, a residential scheme consisting of 229 apartments and an extension to the British Museum. Stirk also contributed to the design of several key masterplanning projects including Potsdamer Platz, Berlin and Paddington Basin, London. Stirk was Director in Charge of the expansion to the Lloyds Register of Shipping building at 71 Fenchurch Street, One Hyde Park and 88 Wood Street. Mike Davies was a founding partner of the Richard Rogers Partnership and a senior partner in Rogers Stirk Harbour + Partners. He joined the partnership between Richard Rogers and Renzo Piano in 1971, shortly after they won the commission to design the Pompidou Centre in Paris, and later became one of the founding directors of the Richard Rogers Partnership in 1977. Davies was the project director for the Millennium Dome in London and for Terminal 5 at Heathrow Airport and is currently project director for Grand Paris. He stepped down from his role in the company at the end of 2015. Rogers Stirk Harbour reorganised the business at the end of 2015 and Davies stepped down from his role as a partner in the company. He was to continue working for them in a part-time capacity. Marco Goldschmied first joined Richard Rogers in 1969. He was co-founder of the Richard Rogers Partnership along with Mike Davies and John Young in 1977 became its managing director in 1984. He left the practice on 30 June 2004. Rogers and Goldschmied were involved in a £10 million lawsuit, which was settled out of court in 2006, where the Richard Rogers Partnership would remain in the property along with River Café. Laurie Abbott joined Team 4 as an assistant architect, working on Creek Vean in Cornwall. He built small development of properties in Frimley, was a senior director at the Richard Rogers Partnership, and was involved in the Pompidou Centre and the Lloyd's building. Amanda Levete was born 17 November 1955. She joined the Richard Rogers Partnership in 1984, and left in 1989 to join Jan Kaplický as a partner in Future Systems. Richard and Su Rogers along with John Young and Laurie Abbott, went into partnership after Team 4 had dissolved. He continued to work with Richard Rogers while in the Piano + Rogers partnership. Young along with Goldschmeid, Davies and Rogers set up the Richard Rogers Partnership in 1976. ^ "RIBA Announces 2015 Stirling Prize Shortlist". ArchDaily. Retrieved 2016-03-25. ^ "People Partners". Rogers Stirk Harbour + Partners. Retrieved 2016-03-17. ^ a b c d "Interview: architects Richard Rogers, Graham Stirk and Ivan Harbour". The Guardian. 28 January 2012. Retrieved 17 March 2016. ^ "Theory: Public domain". Rogers Stirk Harbour + Partners. Retrieved 2010-12-12. ^ "Social awareness". Rogers Stirk Harbour + Partners. Retrieved 2010-12-12. ^ a b c Laura Mark (17 November 2015). "Davies to step down as RSHP announces new partners". The Architects' Journal. Retrieved 16 March 2016. ^ a b "Oxley Woods wins the Manser Medal". RIBA. Retrieved 2010-12-12. ^ a b "RIBA Stirling Prize 2009". RIBA. Archived from the original on 2009-09-30. Retrieved 2009-11-26. ^ "Riba Stirling Prize 2015: NEO Bankside". BBC News. Retrieved 13 October 2015. ^ Glancey, Jonathan (21 November 2001). "It's been so long, is terminal 5 now out of date?". The Guardian. Retrieved 2012-07-11. ^ Kennicott, Phil (23 July 2009). "Richard Rogers's New Jersey Avenue Building a Tame Return to Capitol". The Washington Post. Retrieved 2015-07-11. ^ Moore, Rowan (23 January 2011). "One Hyde Park – review". The Observer. Retrieved 2012-07-11. ^ "NEO Bankside". New London Architecture. Archived from the original on 15 January 2015. Retrieved 15 January 2015. ^ "Renzo Piano joins Rogers Stirk Harbour and Wilkinson Eyre for Sydney harbour overhaul". www.dezeen.com. Retrieved 24 November 2015. ^ "Richard Rogers". Rogers Stirk Harbour + Partners. Retrieved 2010-07-04. ^ "Richard Rogers, Architect (1933-), From the House to the City". Design Museum. Retrieved 2009-10-04. ^ "Ivan Harbour". Rogers Stirk Harbour + Partners. Retrieved 2010-07-04. ^ "Graham Stirk". Rogers Stirk Harbour + Partners. Retrieved 2010-07-04. ^ Tim Walker (19 November 2011). "Any colour as long as it's red". The Independent. Retrieved 20 April 2013. ^ "Mike Davies". Rogers Stirk Harbour + Partners. Retrieved 2010-07-04. ^ Allinson, Kenneth (2008). The Architects and Architecture of London. Oxford and Burlington: Elsevier. ISBN 9780750683371. Retrieved 2010-07-03. ^ "Rogers MD Marco Goldschmied declares retirement rumours true". HighBeam Research. Retrieved 2010-07-04. ^ "Rogers and Goldschmied end legal battle out of court". Architects' Journal. Retrieved 2014-05-05. ^ "Creekvean and Attached Entrance Bridge and Walls to Road, Feock". BritishListedBuildings.co.uk. Retrieved 2014-06-15. ^ "Richard Rogers, Pritzker Speech" (PDF). Rogers Stirk Harbour + Partners. Archived from the original (PDF) on 2011-07-15. Retrieved 2010-07-08.